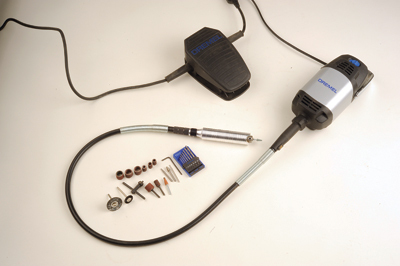 The Fortiflex is Dremel's updated version of the Motoflex unit, which in its day, was well received by carvers for its power, versatility and reliability. When Dremel announced that they were ceasing production of this model, there were gasps and grumbles up and down the country. Thankfully, the company had an updated version up its sleeve, recently unveiling the Fortiflex as the power carving unit to replace its much-loved predecessor. We, of course, had to have one in the workshop, so called one in as far back as issue 112 to feature in our round-up of power carving units. We had only been using it for a short time then, but we were impressed enough to award it Editor's Choice in the round-up. As we have had it in the workshop for about a year, it felt fitting to allocate it its own test page, and see how it has fared long-term. The first thing you notice about this unit is how reassuringly robust and solid it looks, and indeed, feels. The 300W motor links up to a sturdy variable speed foot pedal at one end, and the flex shaft at the other, onto which attaches a supplied push-fit handpiece. A variety of accessories can be fitted onto the handpiece through a chuck system, the shank diameter being a useful 0.3-4mm. Now just hang the unit up, plug in and you're ready to start. We have used this unit on a range of projects and a variety of timbers, for shaping, sanding and cutting, and it has always performed exceptionally well. The speed range of 0-20,000rpm is just superb, with precision cutting and power not affected at either the lower or higher end of the scale. Delicate areas where slow and careful work is required, are helped by the fact that the Fortiflex is capable of high torque at low speeds, meaning you get plenty of oomph even though you are running the unit at slow speeds. The handpiece is really very comfortable and light in the hand, and vibration is at a minimum, so you can keep working for longer periods without user fatigue setting in. I perhaps would have preferred a slimmer handpiece as I have small hands, but I cannot really complain as it is an unusual bonus to have one included in the box in the first place! Plus if you have them, you can use handpieces from other makes using the push-fit system. A nice safety feature with the Fortiflex is that once you take your foot of the pedal, the whole unit stops dead, rather than the expected slow stop found on other units of this kind. 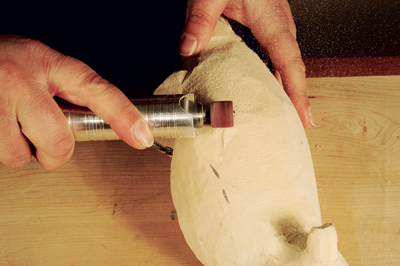 The Fortiflex is the perfect all-round, heavy-duty, power carving unit, which is a fantastic companion in the workshop, and will handle virtually anything you throw at it with ease. This certainly still deserves the accolade of Editor's Choice, and I'm sure it will for some time to come!